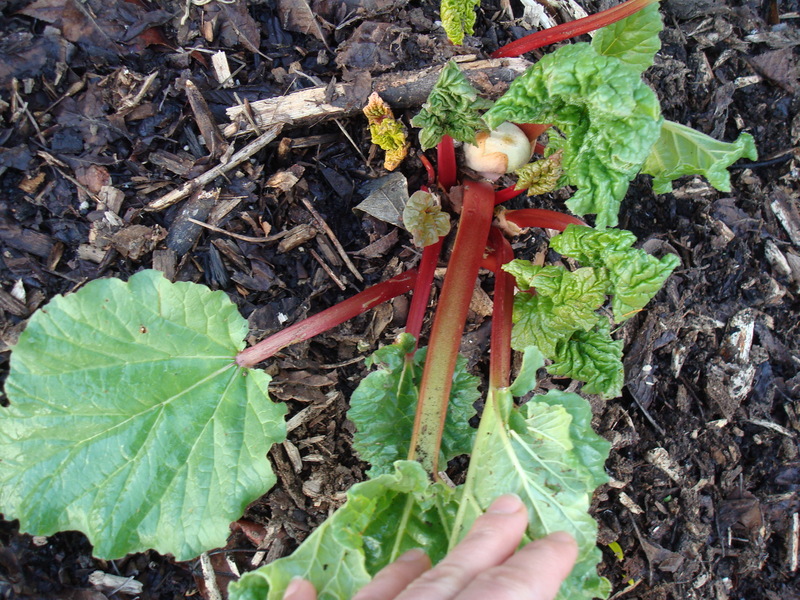 Back from the Dead: Ruby-Red Rhubarb Stalks Emerging in the Garden. I realized it was finally time to use that gallon-size bag of sliced rhubarb I had frozen when I saw the ruby-red stalks poking up through the mulch in the garden. I couldn’t get enough rhubarb last spring. I think I o.d.-ed on the stuff last April and May, returning home with big bunches of it every time I visited the farmers market. But I never touched that frozen bag of it last fall or winter. I think, as with asparagus and blackberries, and of course, fresh tomatoes, I just prefer to eat my heart out when it’s in season and then abstain until the fresh crop emerges the following spring or summer. That first fresh bite never tastes as good as their frozen counterpart from last season. So before rhubarb arrives, I’m trying to use up the frozen stuff. I made a soupy strawberry-rhubarb crisp last night, with the frozen local strawberries I also ignored this winter. 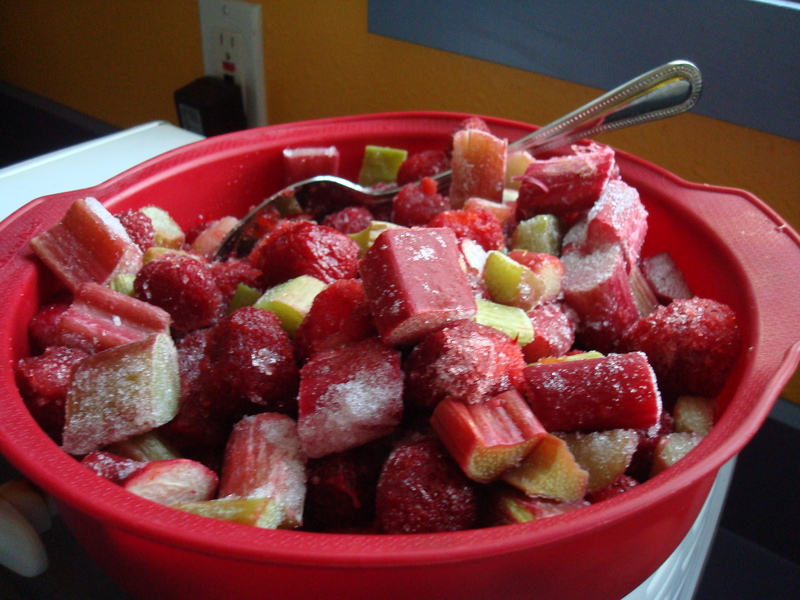 I might make rhubarb compote/syrup with the remaining chunks. The rhubarb crop should be early this year, if my garden is any indication. It’s amazing how the perennial plant completely dies back, disappears, when it gets cold, only to reappear again, through its mulchy mound, come February. But I might not crave the tart pie plant as much this spring, since I’m indulging in the frozen stuff now. What will you make with it once rhubarb season begins? On second thought, maybe you should freeze some so once cherries are in season, you’ll have enough on hand to make this fabulous Bing cherry-rhubarb brown betty I discovered last season. Neglected All Winter: My Frozen Local Rhubarb and Strawberries. I lost my frozen rhubarb in a freezer incident so I’m really looking forward to the fresh stuff! Thanks Alison! My husband was just saying he’d prefer rhubarb bread, which I made once! How did you find my blog?